If you haven't read the series in a long time and need some refreshing, I would definitely recommend rereading "The Assassin and the Healer" from Assassin's Blade, as it introduces the character of Yrene Towers (one of the main characters in Tower of Dawn) and maybe also Queen of Shadows, which takes place right before TOD. So, at the end of QOS, we have a small parting of ways. After the destruction of the glass castle in Rifthold and the subsequent revelations about Erawan and the greater threat to the world, Aelin and her crew (Rowan, Aedion, Lysandra, and eventually Dorian and Manon) go off on their way as shown in Empire of Storms, while Chaol and Nesryn head to the Southern Continent to see if they can drum up some allies for the war and to see if the healers at the Torre Cesme can get Chaol walking again after his spinal injury. Thoughts: Thus, this is Tower of Dawn in a nutshell. A very SMALL nutshell, because this book ended up being so much more than just "the Chaol book," though I was already on board for that too. There are a few references to the events of EOS kind of sprinkled throughout TOD, I guess to give you an idea of how the two timelines line up. I'm not going to lie-- when we later hear about Aelin "walking away" from the Maeve confrontation, I definitely got SUPER sad. TOD has action, of course, but I love-love-loved the character development. Yes, this is Chaol's story, but it's also Nesryn's story, and Yrene's story, and the story of an entire different nation of people who have been there all this time, existing while s*** was going down in the Northern Continent. I can understand why SJM ended up writing WAY more than she planned, and I'm so glad she did--this was a very rich world she built, and I loved reading about it. Those two crazy kids do manage to get their s*** together by the end of QOS, and she does technically save his life, but he manages to lose one more thing, one very important thing: himself. Or, at least, his body. Chaol the soldier, who could always rely on himself and his body if nothing else, finds himself in a wheelchair after the end of QOS, and no matter how much he might insist that he and Aelin left things on a good note, this whollllllllllle ordeal is bound to leave scars, and not just physical ones. And I'm so glad that this gets dealt with in TOD. MILD SPOILERS IN THE PARAGRAPH BELOW!!!!! My favorite part of all of TOD is the climactic moment when Chaol REALLY confronts his feelings about Aelin, as well as himself, because before that moment, I never really saw how TRULY under-his-skin she was. To me, they had a tragic romance, but it did lead to Aelin finding her mate, so yeah, all was well and good. It wasn't until I got to this scene in TOD that I realized the extent to which Chaol loved her (which we got in COM, but not like THIS), and the extent to which his heart was broken a million times over, as well as the extent to which he feels responsible for so many of the bad things that have happened. WOW. And as I've never stopped loving Chaol, I'm so glad he is able to finally find happiness and peace in this book, because he truly is a good guy. He's just been through a LOT. Nesryn is a fascinating character. At first we know her (in QOS) as "the other woman" Chaol occasionally sleeps with but doesn't QUITE want a relationship with, especially after the intensity of his relationship with Celaena, and you know, I gotta feel bad for her. She's not even the rebound girlfriend; she's the rebound friend-with-benefits. But she's okay with this arrangement too, so I don't feel quite so bad, and also, she's a badass archer. "BUT SHE DESERVES BETTER!" I say. In TOD, she's the new Captain of the Guard for Adarlan (taking over Chaol's old post), and now she's also the biracial, bicultural head soldier for the empire that has been known for being cruel and corrupt towards foreigners, especially those from the Southern continent (which her father is). To the random stranger, she appears to be... you know, that type of woman who seems to be okay with working for a rampant misogynist, or that type of POC who seems to be okay with working for a total racist. (There are many terms for this.) Granted, she always was a soldier in the Adarlan army, had worked for them while they were still under evil control, but reputations have a way of sticking, and even though Dorian is now the King for whom she is the Captain, it still... kinda looks bad. Especially since she is in the Southern Continent for this book. She does get asked about this by other characters in the book. So these are two interesting positions that Nesryn is in. She's made this huge journey to help a man who really only just recently made any kind of romantic commitment to her whatsoever, and to help a country that until now was guilty of persecuting her people. Yrene is an interesting foil to both characters in this book, but she is far from being merely a foil. She's a healer, one of a relatively small amount of people who have been blessed with healing magic, and she also happens to be one of the most talented healers at the Torre Cesme (the academy/center for healing in the South Continent). As she debates her own conflicted ethics about helping Chaol (because it was Adarlan soldiers who burned her mother alive when Yrene was 11), we start to see that she's got a much bigger role to play in this story than just getting Chaol to walk again. ALL THIS TO SAY, that this final installment coming out next year is going to be pretty friggin' epic. I'm already anticipating the book hangover. 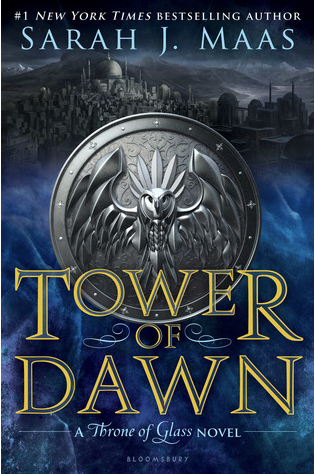 TOD was awesome, in a different way from the other books in the series, and I liked it way more than I thought I would. Read it, friends.